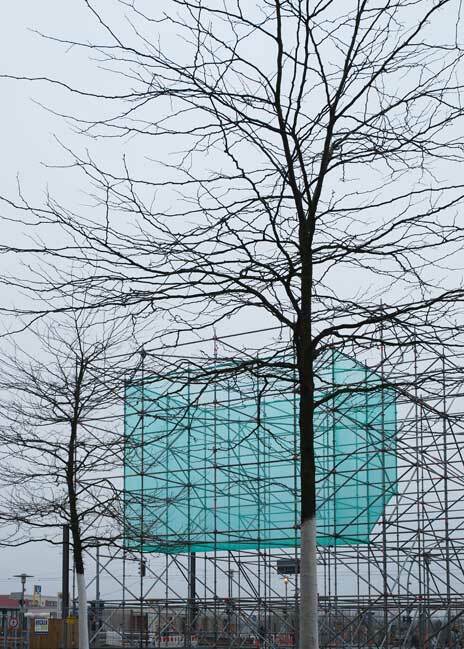 This temporary urban intervention called Luftschloss (cloud castle) was made by Anna Borgman in cooperation with Candy Lenk on Alice Salomon Square in Berlin (Hellersdorf). This intervention was the result of the examination of the fragmentation and in-completion of the space and the disappointed hopes for permanence and wholeness. This installation was divided into four phases showing different stages of transformation. Using the imagery of a construction site, the object received a dynamic form and became a transitional work whose presence already contains its own absence. Materials normally used to conceal the construction process became building materials. The installation oscillated between permanence and volatility, the grounded tectonics of a construction site and the placeless hovering of a cloud. It revealed its artistic intention only through its structural discrepancies. The staged construction site links back to the never completed plans of the large scale housing development in Hellersdorf. The three-dimensional forms within the scaffolding are changed periodically so that the object is continuously in an in-between state. The observer is left with the growing realisation that the transitional form is the final gestalt of the object. The video above shows that there is a lack of motivation and enthusiasm that denotes absence or deficiency in desire or interest. Passers-by not even wonder about this urban installation.